How Would Blessed Cardinal Newman Teach The Narcissistic Religion Teacher? You are at:Home»The Catholic Family»Education»How Would Blessed Cardinal Newman Teach The Narcissistic Religion Teacher? St. James tells us if we lack wisdom to ask God because He will give generously. Our petition should rest on a genuine faith attributed to Him. If not, then the opposite of faith — doubt — will cause us to be like a wave of the seas that is driven and tossed by the wind (1: 5-6). We can easily attribute this same scenario to a classroom full of students listening to a teacher go to-and-fro about something related to the Catholic faith, but never getting there. Scenarios like this make students either walk the plank or abandon ship all together. The art of teaching the Catholic faith doesn’t need to be the most horrifying thing one goes through. The thought of twenty-something high school students waiting, or better yet daring you to show up and teach them something profound should not stop you in your catechetical tracts and make you scream mea culpa, mea culpa, mea culpa! It is not surprising when fear sets that an immediate tendency is to fall back and make the lesson about you instead of Church teaching. I’ve personally witnessed this phenomenon for years and it typically leads to a dilution of doctrinal instruction that leaves the student wondering how the teacher watering her flowers has any applicability to Moses and the parting of the Red Sea. One way to address this phenomenon is by familiarizing ourselves with a beautiful little gem by Blessed John Henry Cardinal Newman. In his great work An Essay in Aid of A Grammar of Assent, Blessed Newman describes “Credence” as the act by which we give credence to propositions or, in other words, an obedience of faith. He goes on to say it is the sort of assent which we give to those opinions and professed facts which are ever presenting themselves to us without any effort of ours, and which we commonly take for granted . The propositions Blessed Newman refers to are carefully embedded in the Creed. At the heart of what Blessed Newman is asking of us is to become knowledgeable of these propositions or what has been made visible by God through His Son Jesus Christ. At the heart of the Creed is a free assent “I believe.” The catechetical effectiveness of any religion teacher rests on our fidelity in the Church’s proposition over our own. This does not mean we cannot use our own personal experiences to aid the instruction, but it should not be the primary focus. Another point to consider when dealing with the narcissistic religion teacher is the assumption that a student is incapable of understanding the doctrinal propositions of the Church. Thus the religion teacher takes it upon him or herself to reinterpret doctrine for the sake of the student when in reality it is for the sake of the teacher. Blessed Newman refers to the nature of religion as “the knowledge of God, of His Will, and of our duties toward Him ,” (pg. 303). He goes on to describe three ways by which nature allows us to acquire this knowledge of God: “our own minds, the voice of mankind, and the course of the world, that is, of human life and human affairs,” (ibid). In other words, he presents a perfect balance of knowledge through study and knowledge through experience where in-turn it leads us to a fuller understanding of who God is. Perhaps no scripture passage better encapsulates Blessed Newman’s teaching methodology than the Annunciation in Luke’s Gospel. 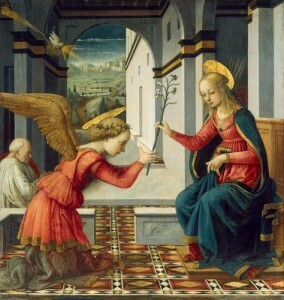 At first we see the Archangel Gabriel make a profound announcement to Mary: “Hail Full of Grace” this unique proclamation, if you will, immediately identifies what the Lord declares unto Mary: that she is without sin and is highly favored with God (Lk 1:28 ff.) If we take this example and apply it within the context of the classroom, our instruction should be directed toward the specific doctrine we are about to teach and announce to the whole class, whether through Sacred Scripture, Sacred Music, Sacred Art or in any proper method that would grab the attention of the students. Next we see the Archangel Gabriel declare unto Mary: “The Lord is with you.” This statement immediately reassures Mary that she is not alone, God is truly present. It is important that we actively draw the Blessed Trinity into our catechetical instruction through the visible presence of the Crucifix, a sacred space adorned with liturgical colors etc. After Mary expressed concern over this pronouncement the Archangel Gabriel reassures her to not be afraid; “for you have found favor with God.” Students tend to express concern, or at times defiance, when a particular aspect of Church teaching is confusing. It is the responsibility of the catechist to reassure students about what the Church teaches and why. The climax of any doctrinal instruction is the development of an intimate relationship with Jesus Christ. Mary’s acceptance and obedience of faith: And Mary said: “Behold, I am the handmaid of the Lord, let it be to me according to your word.” As a faithful servant who knew no sin Mary, accepts the instruction delivered by the Archangel Gabriel and professes her fidelity to God. The method here rests on the faithful transmission of the Gospel by the catechist and the faithful acceptance of the faith by the student. This means that the catechist actively lives out his or her Catholic faith in response to God’s call through His Son Jesus Christ. The Annunciation provides a clear example of what an assent of faith looks like and how to go about presenting the proposition to assent to a creed. Our Blessed Mother freely exercised her faith and assents to the message brought forth by God through the Archangel Gabriel. We see Blessed Newman’s propositions clearly articulated in the Annunciation. It is not about the teacher, it’s about offering an authentic opportunity to assent to the will of Christ and His Church. By the way it is available as a free Gutenberg EBook.